The Eruv extends across Stella Link at the Specs Liquor store (northeast corner of Linkwood at Stella Link) and continues on the EAST side of the street until just SOUTH of Latma, providing access to the Leeshire neighborhood. The feeder roads are OUTSIDE the Eruv; the sound walls are the boundaries. The Greenwillow tunnel under is INSIDE the Eruv. The sidewalk on the SOUTH side of N. Braeswood Blvd. between UOS and is INSIDE the Eruv. Because a portion of the NORTH side of N. Braeswood Blvd. is OUTSIDE the Eruv, use the sidewalk on the SOUTH side of N. Braeswood Blvd. between UOS and to remain within the Eruv. Halstead, 4620 N. Braeswood Blvd. Use the pedestrian gate at Meyer Park Drive then cross to the SOUTH side of N. Braeswood Blvd. Meritage, 4550 N. Braeswood Blvd. Exit the apartments onto N. Braeswood Blvd. then cross the street to the SOUTH side of N. Braeswood Blvd. 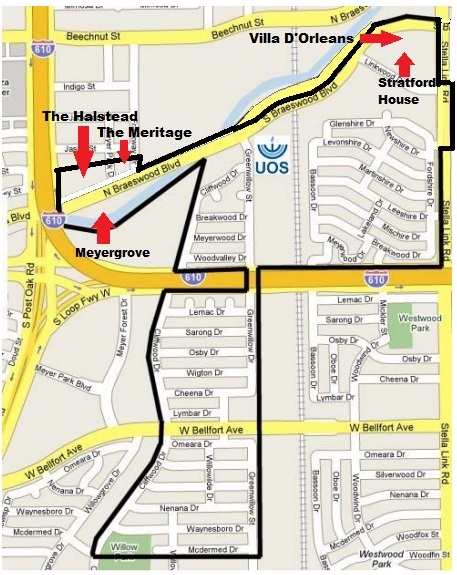 Meyergrove, 4605 North Braeswood Blvd. Use the sidewalk on the SOUTH side of N. Braeswood Blvd. (same side as the apartments).